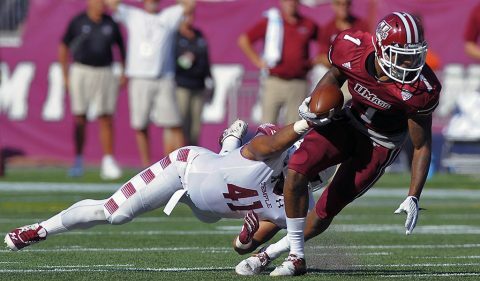 During his four years at UMass, he had 277 catches, 3,386 receiving yards and 16 touchdowns. He was selected Phil Steele Preseason All-MAC First Team Wide Receiver and the Athlon Sports Preseason All-MAC First Team Wide Receiver. Sharpe is a big, lean, smooth receiver that has excellent route running skills. He can work the short, intermediate and deep routes well. He is a tough matchup for the defense. He will make a great possession receiver.